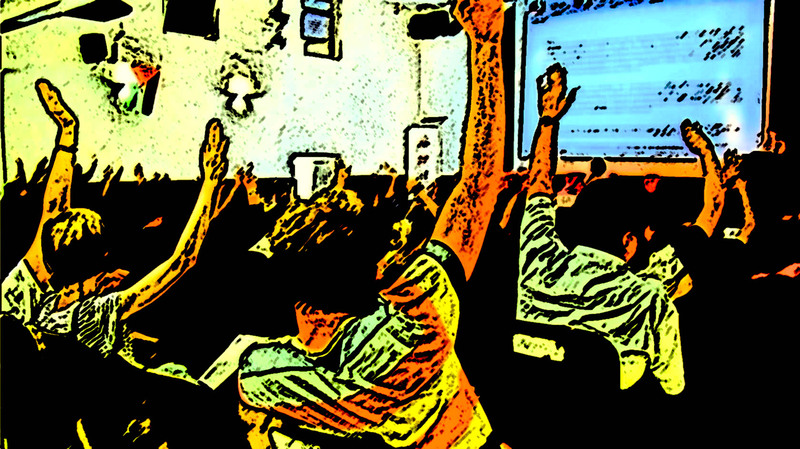 Majority vote in support of the Boycott Divestment and Sanctions campaign during the International Conference of Critical Geography, 30 July 2015. Source: iccg2015.org. This past summer the International Critical Geography Group (ICGG) convened its seventh conference in the occupied city of Ramallah, Palestine. Following a two-decade tradition and nearly three years of preparation, the conference brought together scholars and activists committed to combating social exploitation and oppression. This was our first gathering in the Middle East, one that was transformative for participants. Together we opened up a new vista for critical geography that is both timely and long overdue. Our five days (and six nights) program was packed with inspiring and thought-provoking engagements anchored around the theme Precarious Radicalism on Shifting Grounds: Towards a Politics of Possibility. Breaking the limits of existing academic paradigms, we shared analysis of the mounting crises of capital, space, bodies and nature and explored ways to turn them into moments of political possibility by reconnecting scholarship with solidarity and struggle. The statement Forging Solidarity, taking a stand on Palestine is more than a resolution. It is both a political statement in solidarity with the anti-colonial struggle of our Palestinian comrades and the agenda for a new paradigm in critical geography that radically expands the International Critical Geography Group’s founding statement of purpose. The widespread Palestinian anger and protests we are witnessing throughout historic Palestine in response to Israel’s intensification of a long history of ethnic cleansing, house demolitions, land theft, repression and imprisonment, remind us that there is an urgent imperative for action to end injustice in Palestine. Building on the momentum generated by the conference and this resolution we aim to open up serious discussion about BDS and the academic boycott of Israel within the Association of American Geographers (AAG), the Royal Geographical Society (RGS), the International Geographical Union (IGU), and other geographical societies to bring them on board. It is time to further the work of decolonizing the discipline of geography and we can do this by consolidating and carrying the conference insights and this resolution into our work as scholars, teachers and change makers. *This press release was published on 13 October 2015 by the ICCG 2015 Organizing Team, along with an Arabic and an English version of the Statement. **For further information please write to connect@iccg2015.org. ***Earlier impressions from Palestine published by ENTITLE members particiating in the ICCG can be found here, here and here.